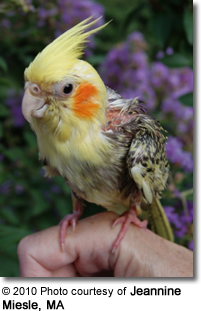 Below is the story of a rescued cockatiel with multiple serious health problems, including xanthomas, lesions, malnutrition, Clostridium, Giardia and an atrophied uropygial gland. Rescuer Jeannine Miesle recounts her path to recovery. Below is Marcie's History and Updates for 2010. 2011 and 2012 history and updates. Do you believe that we are predetermined to be in a particular time and place for a specific reason? I am convinced this happened to me. June of 2010 found me volunteering at an avian shelter. 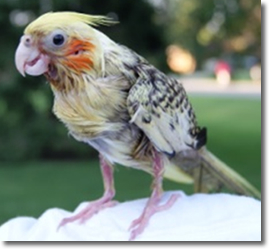 I had been working there for two months when a man brought in a little hen cockatiel in horrific condition. 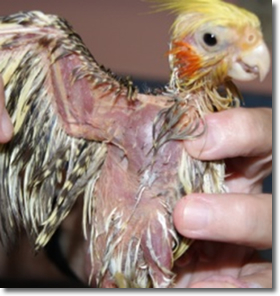 She had almost no feathers on her neck, back, or legs, and few on her breast. The feathers on her wings and tail were bent, broken, sparse, frail, and unhealthy-looking. She appeared to be teetering between life and death. He had purchased her at an auction, poor thing, and in fact, was going to "drownd her in the toilet." But fortunately, someone informed him of the shelter, and he had enough human kindness in him to bring her in. It is incomprehensible that anyone would even consider doing that, but the shelters and sanctuaries are overflowing with animals that were subjected to that type of neglect and destined to meet that same fate. That was my lucky day! Two days later, June 30, when I arrived to volunteer, the owner removed her from the cage she was sharing with several other cockatiels, and I snatched her up. “May I take her?” I requested, anxiously. “I knew you’d want her,” she replied, and from the next day to the present, Dr. Bob Dahlhausen and I have been endeavoring to provide for her some semblance of health. 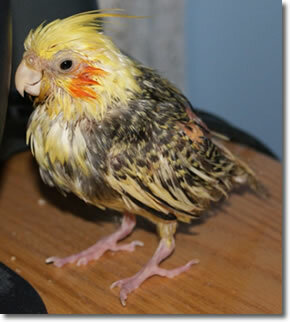 The following day, before I could transport her to his office for an examination, I felt it necessary to bathe her. She was so soiled and disheveled he would have been hard-pressed to examine her properly. One large, necrotic-looking lesion under the left wing; dried blood was caked to the skin, covering oozing, red, bloody tissue. The area was filled with dirt. He initiated a treatment plan for her, even though he was doubtful she’d live another 24 hours. He gave her 48 hours at most, saying, “She could crash at any moment. Don’t get your hopes up.” I must have looked crestfallen. He added, “Let’s give her a chance.” Despite her many infirmities, I decided she was worth whatever financial, time and energy investments her healing would require. 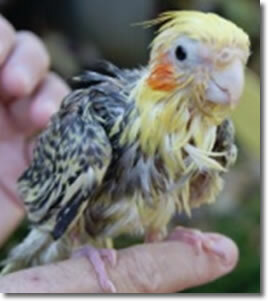 I had adopted ill birds before, but never one this close to death or with such a plethora of issues. He prescribed Metronidozole and LS 50 for two weeks for the clostridium, giardia and negative bacteria in her intestines. I was to apply Gentamicin Sulfate cream along with Aloe Vera gel to her skin several times a day. He also suggested I spritz her with Avix Rain and/or Soother daily. I was then sent home with an extremely weak, sickly bird, the medications, and a glance that implied, “I hope you know what you’re getting yourself into.” Now my part of the effort began. I was aware that we had to survive the first week and put some weight on this little sweetheart before I could breathe easier. It would be a long while before she were out of the woods. The responsibility of caring for her was daunting, but once we arrived home, I put the thought of being unsuccessful out of my head. It was only later that I realized just how close we came to losing her. I elected to place her in a small, 16-inch square cage for the time being; she was very frail and would lose her balance easily. Eventually, she would be in her own, roomy home, but for now this was best. I removed the grid and lined the cage tray with a soft towel covered with paper towels in case she fell. After administering her medications, applying the creams and encouraging her to eat, I allowed her some time to rest. She was exhausted from her ordeal. I thought to myself that if she survives until tomorrow it will be a miracle. As the day wore on, I continued with the same nursing care, and she retired for the night around 9:00. I wanted to medicate her as frequently as possible and comfort her for as long as I could. The next morning found her not only alive, but chirping and begging to be held. And hold her I did, almost the entire day. Such an engaging little dear, she captured our hearts. Her overnight survival was a milestone. Over the next few days, her appetite increased just a little. The pruritis and dermatitis were severe; she would scream in pain when picking at her sores and would often cry out as I touched the inflamed and sensitive skin. The integument was exceedingly delicate and transparent, her sores acutely tender. But she was content to have me apply the cream; those brief respites from her suffering must have been such a relief. I realized that medicating and handling her caused her some discomfort; but mindful that I was in this for the duration, and it was in her best interest, I couldn’t allow emotions to cloud my judgment or ability to tend to her needs. As I applied the creams, I would gently massage the xanthomas, endeavoring to decrease their mass. They are composed of lipids and cholesterol. According to Dr. Bob, the lipids (fats) would be reabsorbed into the body but the cholesterol would not. I was hopeful they would diminish in size. I also massaged the creams into the sizable lesion under the one wing. Gradually, the black, dried blood and red, oozing skin beneath it were replaced with more healthy-looking skin. Accomplishing that took weeks, as the itching skin and swollen feather follicles were relentless, incessant irritants which nearly drove her mad. In mid-July we were once again in Dr. Bob’s office to monitor her improvement and perform another set of Gram’s stains. What a pleasant surprise to find she was free of the giardia and clostridium! The illnesses I anticipated would be the most formidable to cure turned out to be the least difficult. No more bacteria, protozoa or debris! She was now permitted to be off the Metronidozole and LS 50. She had gained a few grams, up to 77, but had such a long way to go to augment her body mass and weight. I wouldn’t feel secure that she were indeed over the worst until she weighed at least 80 grams on a consistent basis. Proper nutrition and vitamins were the missing components in her diet, so I began syringe feeding her the Lafeber’s Emeraid Elemental Omnivore diet, supplemented with Avi-Era vitamins and Missing Link minerals. Up until now, Marcie had slept most of the time; fatigue would overtake her after every event in her day. She was not active, not curious, not interested in the other cockatiels. What little energy she possessed was being poured into her struggle to survive and heal. Her persistence amazed me; she seemed aware of my love and dedication and would snuggle close to my face and neck as I went about my household and bird chores. She couldn’t balance well enough to be on my shoulder, and was too weak to hold on, so I needed to hold her. Sometimes I’d pin a towel to my shirt and place her in that for warmth and comfort. I delighted in these moments, savoring the time we spent together. They were periods of intense bonding. When we returned to Dr. Bob on July 30, Marcie’s weight had risen to 80 grams, and I foolishly assumed that her diet was providing sufficient nourishment. So I discontinued the Emeraid, not putting it together that it was this supplement that had produced her improvement. After a few days without it, I noticed a significant drop in appetite, energy level, and, consequently, weight. So I returned to administering the Emeraid, vitamins and minerals, and almost immediately her appetite and energy level improved. But the pruritis, folliculitis and dermatitis continued to plague her, so Dr. Bob suggested I give her pediatric Benadryl to help stop the itching. It helped for a while. 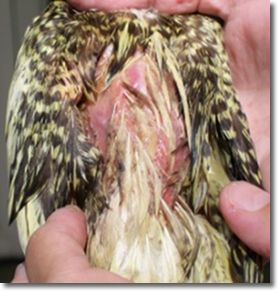 Throughout August, although the xanthomas were shrinking and the dermatitis was improving, the emerging feathers were surrounded by clots of blood that would cling to the dermis at the feather follicle. The entire feather would sometimes fall out when touched. 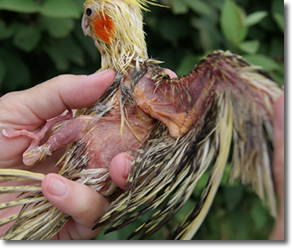 The feather follicles were red and swollen where the oglets (new feathers) appeared. After researching this condition, I concluded that the sheaths simply didn’t have sufficient keratin and collagen to form properly, so the blood that should have been inside the feather sheath was spilling out and forming heavy clots on the newly-forming feathers. The clots would break and bleed easily, irritating the skin, and she would pick at them, causing them to hemorrhage. Observing this, Dr. Bob placed her on a course of Doxycycline. She was beginning to break her tail feathers at this time, too, trying to avoid being medicated and to keep from falling when she’d lose her balance. In order to cool her body down, I would cleanse her hot, dry skin with a wet tissue before each cream application. The bleeding feathers were a mystery. Was there some other, unknown, causative factor involved? By this time, her weight had reached 85 grams. At our subsequent visit in late August, Dr. Bob scrutinized the bleeding feathers. He believed the cause was nutritional. She refused anything but seeds and millet sprays, so her nutritional needs were not being met. He suggested offering her Nutriberries and Avi-Cakes, but they did not appeal to her. He discontinued the Benadryl, adding Celebrex in an effort to control the bleeding. Note the lesions under the wings in the picture below. The hemorrhaging feathers persisted, however, and on Oct. 12, we were back on Dr. Bob’s doorstep. I felt confident that he would suggest a cytological test to determine the nature and cause of the hemorrhaging. By now, he too suspected there was more to this than nutritional deficiencies and performed a culture of the feather pulp. The cytology came back negative for PBFD and Poxvirus, but positive for fungal cells. At last--we had a diagnosis! I was elated! He prescribed the anti-fungal medication, Nyzoral, .1cc. once a day, and I was to continue on the Celebrex for the time being. We saw improvement almost immediately, and the hemorrhaging began to diminish. The next week, I observed that Marcie was having difficulty walking. Just when I thought we had encountered and were addressing all her issues, another problem presented itself. She was walking on the side of her left foot. The long front toe was curving away from the body at the first joint by the nail bed, and she was developing calluses on the bottoms of the toe joints. I was unable to straighten either toe. So back we went. (Were we the first avian hypochondriacs?) First, he examined her skin and feather conditions. He was pleased with the decrease in the folliculitis and red skin, but cultured another feather, just to confirm his diagnosis of fungus. He then addressed the feet. There were, by this time, little lumps on all the joints, and the left front toe digit by the nail bed was quite red and crooked “It’s either arthritis or gout. I’m going to go with arthritis,” he determined, “since the lumps do not have the reddened areas around them, an indicator of gout. On the other hand, the Celebrex might be controlling that. We’ll see what happens over the next couple of weeks.” He prescribed Chondroitin with Meloxicam for her joints. I was to keep her on the Nyzoral for 6- 8 more weeks. He wrapped both front toes to relieve the pressure on the toes and feet. I was to remove the wrap in two weeks and observe the toes’ appearance. He thought it inevitable that she would lose the first digit on the left long toe--possibly on the right as well. By the end of October, only a few incoming feathers were continuing to hemorrhage slightly, but Dr. Bob had reminded me that it could take as long as eight weeks to rid the body completely of the fungal cells, so I was not concerned. Others were emerging normally. I did have two concerns, however—that the present wing and tail feathers were not being forced out by new feathers, and that the incoming feathers were not strong and healthy looking. They appeared thin and delicate compared to normal feathers. The center and lower back were now the only areas that remained without incoming feathers. I continued to cleanse her body and apply the creams four times a day, not only to medicate the skin, but to inspect it. She was much more comfortable with her toes wrapped. Walking and perching were more manageable. She was to keep the wrapping on for two weeks. Her energy level was gradually increasing, and her weight was remaining stable at around 86 grams. Unfortunately, she has continued to ignore fresh foods and vegetables, but was beginning to try Nutriberries and Avi-Cakes. Along with the Elemental nutrition and vitamins, I was confident we were meeting her nutritional needs. On Nov. 16, Dr. Bob saw Marcie for another checkup. “She is doing really well,” he remarked. “We can take her off the Nizoral, and unless her toe condition worsens, she won’t need to have the surgery.” What a relief! Her feathers were coming in quite nicely and very few are bleeding now. We could discontinue the Celebrex for the time being, but she will continue to receive the Emeraid formula indefinitely. As they broke through, very few back feathers were bleeding at this time, but now we had to attend to the changing nature of the xanthomas. The lipids had for the most part been absorbed, and all that remained were the cholesterol layers, which had become friable, brittle, and crusty. The skin had shrunk so much that small globs of yellow/orange, dimpled skin suspended from the underside of the right wing. The epidermis was peeling off, layer by layer, exposing the tender layers of dermal tissue underneath. This delicate and fragile tissue would bleed slightly as the layers peeled off. At the lower section of the xanthomas, curving from the front to the back, oglets (incoming feathers) were attempting to emerge through the xanthomas. This was quite irritating to Marcie, and she would dig at them. If they emerged with blood on them, I pulled them; otherwise, they would simply continue to bleed and would fall out anyway. If they were not bloody, I allowed them to push through the xanthomas. I continued to sponge-bathe her twice a day and apply the creams four times a day. This greatly benefited her by reducing the irritation and softening the skin. 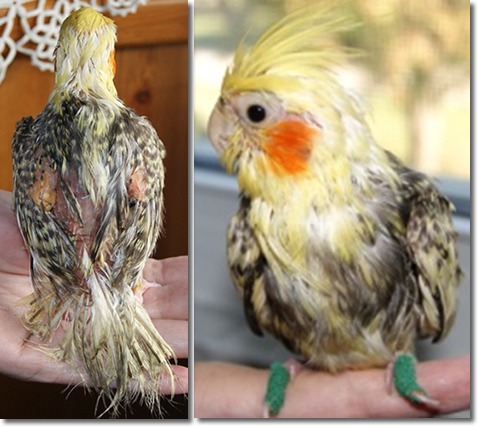 After nearly six months, the original feathers on the wings and tail still had not molted out. My concerns were valid. The new feathers could not break through; the old ones were very hard and strong and in their way. They were endeavoring to emerge, but, as they had no where to go, were becoming impacted. So I began removing the long tail feathers and primaries (longest wing feathers), a few at a time. She looked quite bedraggled and bare afterwards, but in the long run it would be for the best. The incoming feathers were thin and whispy, similar to a neonate’s, but this will be an advantage when she molts them out. The Celebrex was helping to accelerate the healing process. She continued to receive the Emeraid and Glucosamine, and she went off the Nyzoral the following week.. Exhausted from all this stress, she slept considerably more than she had before the feathers were removed; not only was she trying to heal, but now she had to generate all those new feathers. There were times when she would be attentive and lively, discovering new toys and enjoying playtime for short periods, but most of her time was filled with sleep. Her appetite was good and her droppings normal. 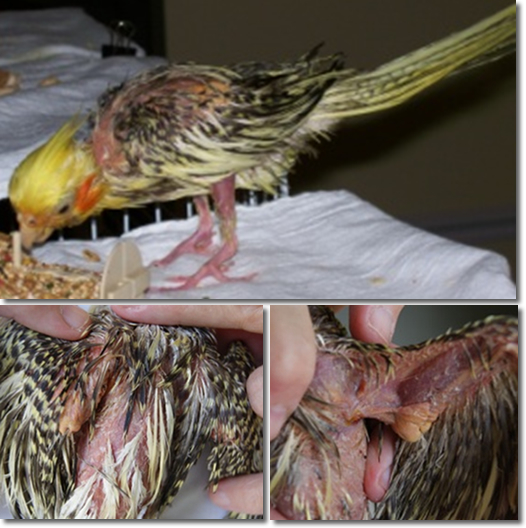 The xanthomas under her wings were still peeling skin, and there was still some redness as the skin peeled away, but the Gentamicin cream healed that quickly. The new feathers on her tail and wings emerged nicely, and the hemorrhaging ceased. She chilled easily and was most content to be held close to me. Without the heavy original feathers to hinder them, the new primaries (longest wing feathers) and tail feathers were able to grow out. The new tail feathers were still thin and wispy, but the few on the wings were more normal in size. These appeared out of place next to the smaller, thinner feathers. Her weight remained around 88 grams. She still would not try soft foods, but she was eating a wider variety of seeds. More body feathers were making their appearance, particularly under the wings. 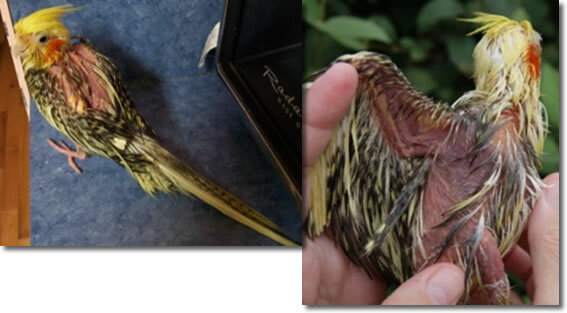 The pictures show how the feather growth pattern began at the neck and spread down her back, and the feathers were pushing through the xanthomas on the outside of the elbow joint on the wing. Only the lower portion of the elbow joint is xanthoma; the upper part is bone and skin that hadn’t been covered with feathers yet. The Avianweb strives to maintain accurate and up-to-date information; however, mistakes do happen. If you would like to correct or update any of the information, please contact us. THANK YOU!